MY KITCHEN IN SPAIN: WHAT'S ON THE MENU FOR NEW YEAR'S EVE? WHAT'S ON THE MENU FOR NEW YEAR'S EVE? Deeply flavorful quail broth with wild mushrooms and sautéed quail breast. In Spain, New Year’s Eve is an occasion for la cena de noche vieja, a late supper with the whole family. After the midnight bells, when it’s customary to swallow 12 grapes to assure good fortune in the new year, the younger ones go out to party until the wee hours. 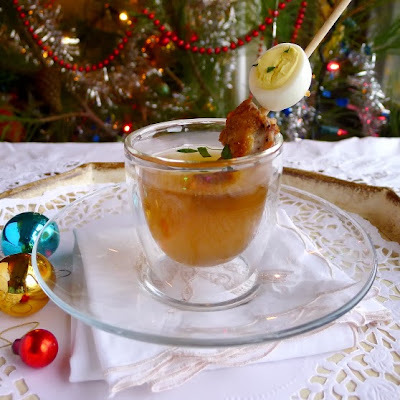 The festive menu might include a platter of mariscos, shellfish such as shrimp, crayfish, crabs, clams; a special soup, such as a consommé or a crema, cream soup; a meat dish such as pork tenderloin; a tart or parfait for dessert, and, of course, more turrón, almond nougat and marzipan, accompanied by cava, Spanish bubbly. This deeply flavorful quail and mushroom consommé just might fit the bill for your party menu. I have served it as a welcoming libation for a holiday buffet party on a blustery winter day. In lieu of canapés, I passed the soup in demitasse cups with the sautéed breast meat and mushrooms speared on toothpicks. I’ve also served the soup as a starter for a smaller dinner party. It’s satisfying without being filling and you can vary the garnishes. Serve consommé in cups as an apperitif. Begin preparations for the consommé at least one day and up to 3 days before serving. Any wild or cultivated mushroom can be used—cêpes are divine, oyster mushrooms are fine. “Clarifying stock” maybe sounds like a cheffy thing to do, but it’s pretty simple and the results are really satisfying. A short-cut, if you don’t want to bother, is to bring the carcasses to a boil, drain them and rinse in running water to remove impurities that will cloud the broth, before putting them to cook. Boning out the quail breasts is fast and easy. Use a small sharp knife to slit down along the ridge of the breastbone. Cut through the skin at the neck and release the half-breast where the wing is attached. Cut away the other half-breast in the same manner. Leave the skin attached to the breasts. Brandy de Jerez (brandy aged in Sherry casks in Jerez de la Frontera where Sherry is made) lends a deep, mellow flavor to the soup. Dry fino or amontillado Sherry could be used instead. 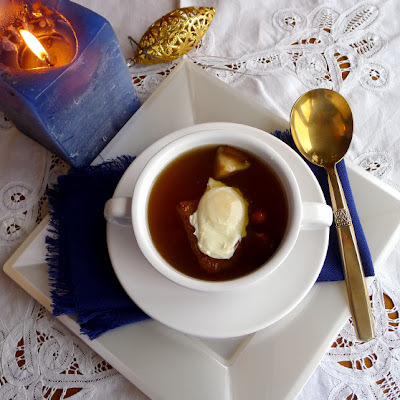 Sherry is the perfect wine to accompany the consommé. Vary the garnishes--here with a poached quail's egg. Serves 12-16 as an appertif or 6-8 as a soup course. 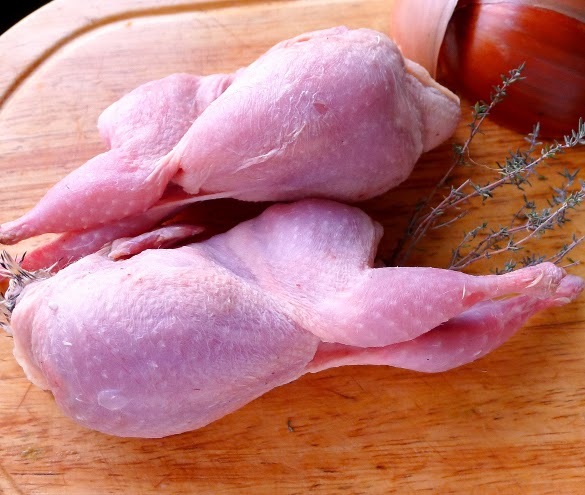 Wrap the boned quail breasts in plastic wrap and refrigerate them until shortly before serving. Spread the remaining quail carcasses in a roasting pan and drizzle with olive oil. Place the unskinned onion in the pan with the quail and roast, turning quail occasionally, until well browned, about 45 minutes. Transfer quail and onion to a large soup pot. Add ¼ cup water to the roasting pan and scrape up all the drippings. Add them to the soup pot. Set aside 2 ounces (about 1/3 cup) of mushroom caps or slices to finish the soup. Chop the remainder and add them to the soup pot with the chicken stock, leek, carrots, celery, tomato, salt, pepper, thyme, bay leaves, and parsley. Bring to a boil and skim off any foam that rises to the top. Cover and simmer the broth 1 ½ hours. Remove and cool slightly. Strain the broth in a colander, pressing on the solids to extract all the liquid. Discard the solids. (You may want to separate the legs and serve them with vinaigrette.) Cool the broth, then refrigerate, covered, at least 12 hours or up to 2 days. Skim off and discard the fat from the top of the broth. Strain the broth into a clean soup pot and add the egg whites and crushed eggshells. Place on a medium heat, stirring occasionally, until the broth begins to simmer. Lower heat so it barely simmers for 15 minutes, without stirring, rotating the pot a quarter of a turn at intervals. Keep a close watch so the broth never boils. As the egg white cooks and floats to the top it will carry along solids that cloud the broth. Remove from heat and allow to stand 10 minutes. Line a colander with 4 thicknesses of damp cheesecloth and place it over a clean pot. Gently push the egg-white froth to one side and carefully ladle the broth into the colander. Discard the foam. Shortly before serving, place the pot of clarified broth on a medium heat and add the brandy. Bring to a simmer. Sprinkle the quail breasts with salt and pepper. Heat the virgin olive oil in a skillet and sauté the breasts, skin side down, on a medium heat until browned, about 1 minute. Turn and sauté 1 minute on the other side. Breasts will be pink in the center. Remove and keep them warm. Sauté the reserved mushroom caps or slices in the same oil, about 1 minute on each side. When the broth begins to boil, lower heat so that it simmers and add the shredded spinach. Cook 2 minutes until spinach is wilted. 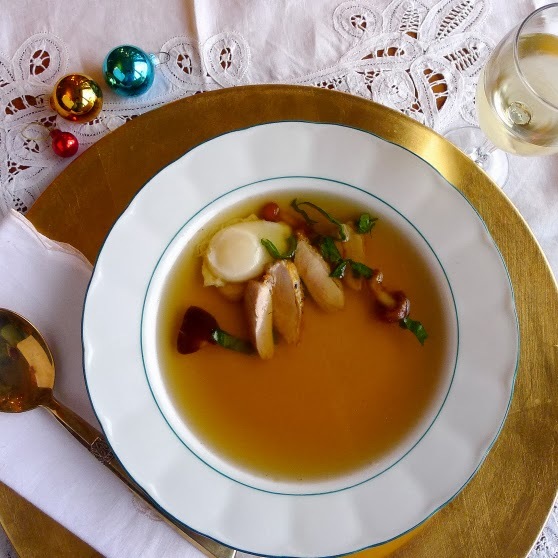 Serve the consommé in small (½-cup) cups with the breast and mushroom cap speared on a toothpick or in shallow soup bowls with the sliced breast and mushroom placed in the bowls. Add poached or hard-cooked and peeled quail eggs, if desired.